Harley-Davidson are no newcomers to trikes. In fact, with their utility Servicar in production between 1932 and 1975, followed by the luxurious Tri Glide Ultra Classic from 2009 (basically an Electra Glide with an extra wheel), the American marque have more three-wheeler experience than any other mainstream manufacturer. Which is one reason why this latest offering is worth a look. 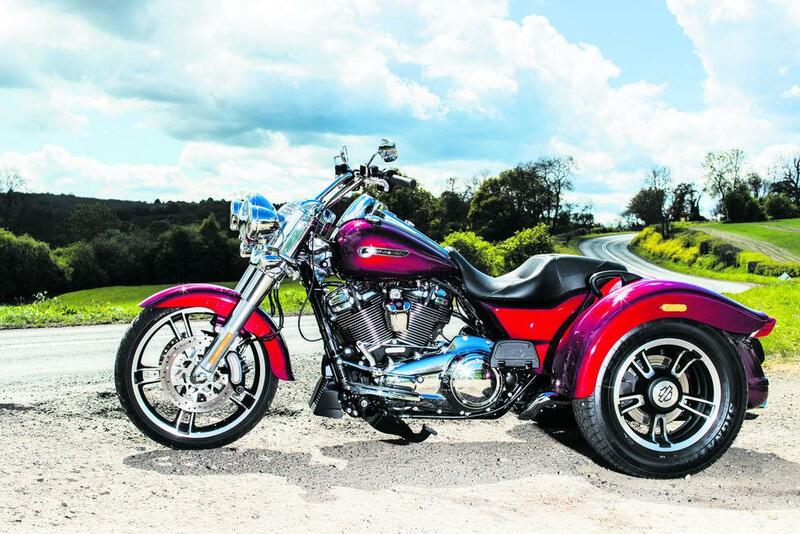 The idea, Harley say, is to put stripped-down custom style on to a three-wheeler platform. 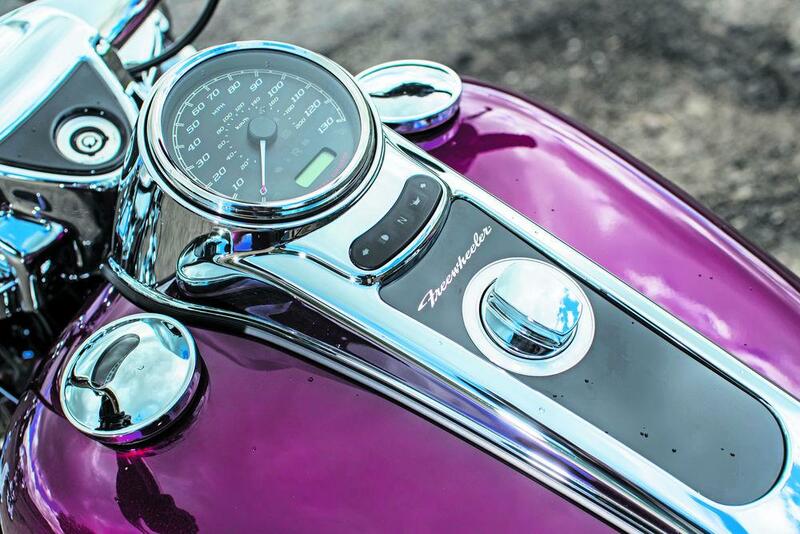 Although using the same basic mechanicals as the Tri Glide, the Freewheeler does without the full-dresser’s big fairing, bulky pillion throne and topbox, not to mention most of its fancy instrumentation and entertainment system. In their place the Freewheeler has a classic, clean, wind-in-your-face Harley front-end complete with mini Apehangers, tank-mounted chromed clocks and 19-inch Street Glide-style front wheel (the Tri Glide has a fat 16-incher). While at the rear, instead of the Glide’s touring topbox and pillion clutter are simple, smooth flanks dominated by macho cast wheels which match the spoke design of the front, proper rear fenders (mudguards to you and me) as on classic cruisers such as the Fat Bob, and a conventional, slimline custom double seat. In terms of style it all works brilliantly well, too. Where the Tri Glide looks enormous, like a Winnebago with handlebars and with the £30k+ price to match, the Freewheeler – slightly cringey name aside – is lean, mean and every inch some kind of SoCal dude machine – like it should be in a Banana Splits or Monkees video. The riding is just as much fun. OK, so the Freewheeler (or any trike) hasn’t the leaning dynamism or traffic-splitting practicality of a two-wheeler; while wrenching it around spirited turns requires considerable effort. But that’s missing the point. The vast majority of trike buyers, for physical or other reasons, can no longer ride or manage motorcycles, and for them this is the next best thing. Although as rigidly planted as any other trike, with steering that gives forearms a good workout and a breadth you constantly have to remind yourself of, once the roads open up, the wind in-your-hair sensation (like with all trikes, helmets aren’t compulsory, but recommended) is a hoot. The perkiness from the new-for-2017 (and now 87bhp) Milwaukee-Eight V-twin is entertaining and engaging; the comfort is decent, although pillions don’t get much to harp on about, and the head-turning ability immense. The Freewheeler’s also beautifully finished and, with an electric reverse gear and decent boot (large enough for two full-face lids) it’s reasonably practical – although I wouldn’t fancy long distances on it. 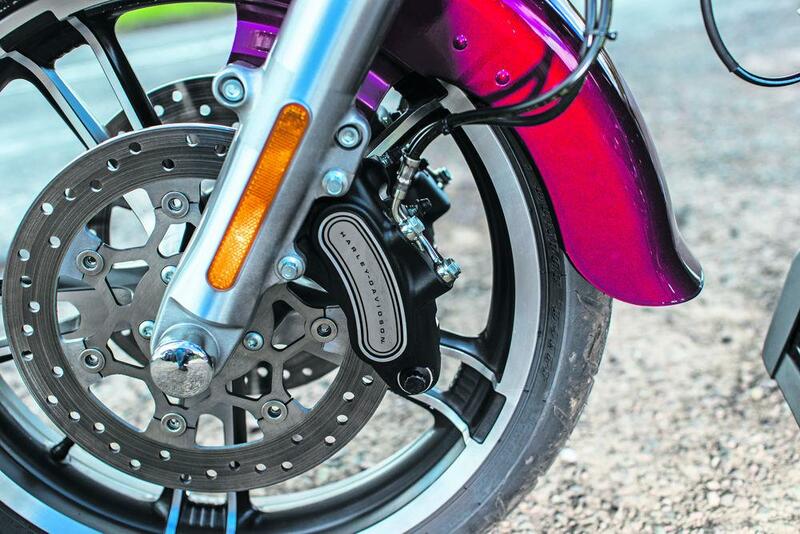 Admittedly, a three-wheeler wouldn’t be my choice – but some aren’t so lucky. If that’s you and you have a full (pre-2013) car or bike licence(otherwise you have to do a dedicated test), a trike has never been so cool. What at first seems a comedy machine is actually brilliantly done and a welcome option. 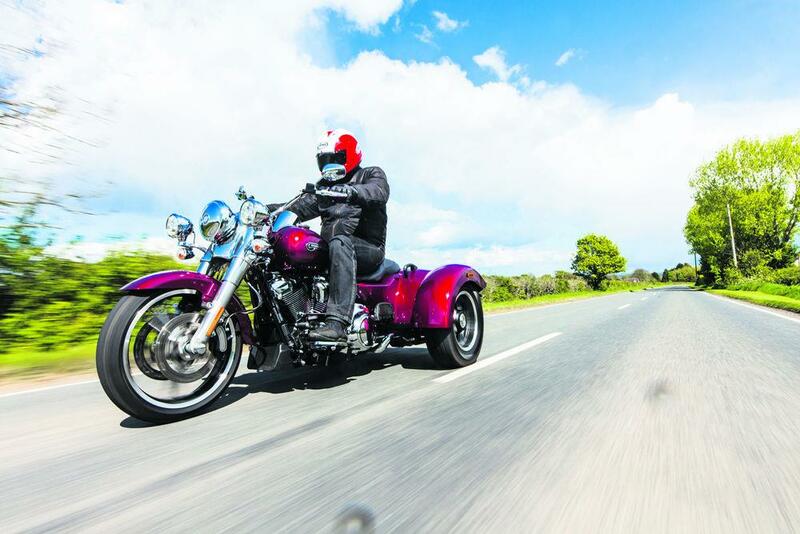 If you want two-up touring the Tri Glide remains the one, but the Freewheeler is far more fun, hugely stylish and cool, for just a fraction of the price at £23,845.